These colorful mushrooms are stacked on top of each other and have nowhere to go. Do you have the skills to clear the board? Bust up these adorable mushrooms to earn crazy high scores and reach the final level. The goal of this classic matching game is to select three or more touching mushrooms of the same color to clear them away. Reach the target score to complete the level and move on. As each level progresses, so does the difficulty. 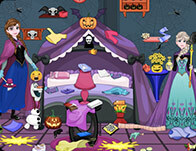 Challenge yourself and see just how far you can go in this fun online matching game for kids! Baby Barbie Which Emoji Are You? You can be the barbie che..
Baby Barbie Ever After Hi..